Australian men have a life expectancy roughly four years earlier than women? Suicide is the leading cause of death for men aged 15-44? The Movember Foundation was established back in 2003 where two mates met for a quiet beer in Melbourne and sparked up the idea of bringing back “The Moustache” for the month of November to create awareness and to “stop men dying too young”. The foundation has grown from 30 participants (all from Australia) in its first year to over 5 million from over 19 countries across the world. The funds raised by the Foundation are used to change the face of men’s health. This is by addressing some of these biggest health issues faced by men of all ages (prostate cancer, testicular cancer, and mental health and suicide prevention). 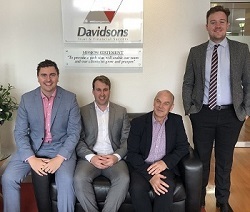 Davidsons are proud to once again be part of this campaign with four of our team members taking on the Movember challenge – having clean shaven on 1st of November, they will leave their mo’s untouched for the entire month.